This article demonstrates cross platform Xamarin mobile application development that consumes a WCF web service using the BasicHttpBinding. In the first part of this article, we will develop WCF service and Xamarin portable class library as a service agent that can be used in our iOS, Android & Windows Phone 8 applications. Yes, you read it right! The WCF service is going to be pretty simple here. It will have one single Sum function for given two integer values. We will mainly focus on approach of consuming it in all platform so keeping service part simple. Create empty Visual Studio solution named XamarinWCF. Add project of type WCF Service application and name it CalculatorService. 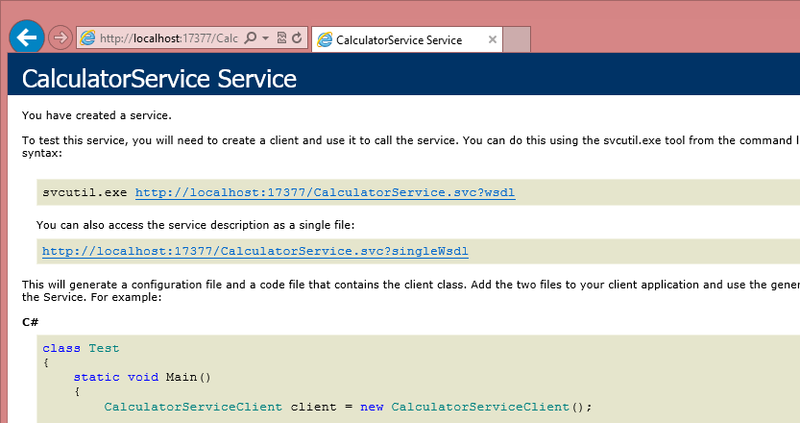 Following two snippets back to back shows ICalculatorService interface and its implementation CalculatorService. Now at this point, just hit F5 to see the service running over IIS express in your browser window. By default, Windows 8 and IIS Express will not accept remote connections. So for remote devices such as an Android/iPhone or Window Phone 8, we need to make two changes as one is to edit IIS express config files to allow remote connections and add firewall rule for the port. 1. Get your local machine's IP address by running ipconfig in command prompt. In my case it is 192.168.216.1. 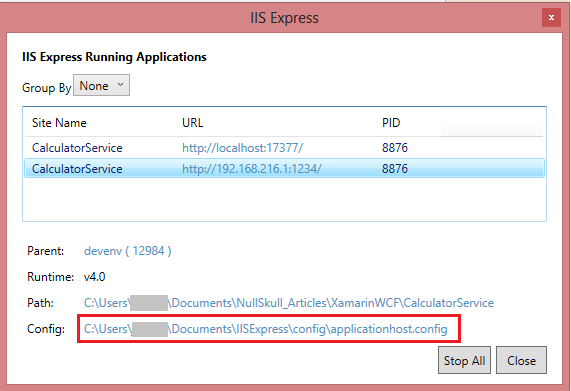 Alternatively you can right click on the task bar icon of IIS express and choose show all applications. It would present you with following screen. As highlighted in Figure 1.1, you can click on the link to open the applicationhost.config file and make changes as described later step. 3. Locate the site element with the name as CalculatorService. Under bindings tag, add entry as highlighted in Listing 1.2. 4. Now configure IIS express to accept incoming connection from the IP we just added by running following in command prompt. Note that we will need elevated permission so run command prompt as Administrator. 5. Last step is to add firewall rule to permit traffic on port 1234 by running following in command prompt. It's time to create our cross platform component "service agent" that will talk to WCF service and will be used in our iOS, Android and Windows Phone 8 application. 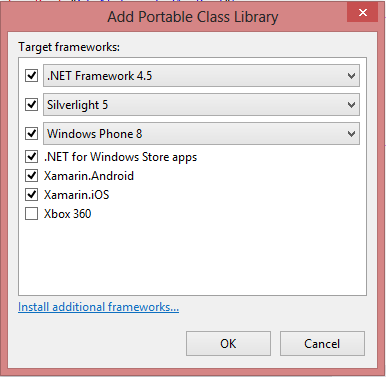 Add project of type Portable Class Library to XamarinWCF solution. As shown in Figure 1.2, we will choose everything as target framework except Xbox 360. Now we need to create WCF service proxy that we can use in our service agent and eventually in all mobile client applications. To do so, we will be using Silverlight WCF proxy generation utility called SLSvcUtil.exe. In elevated command prompt, navigate to this directory and run following command. This will give you CalculatorService.cs file created in the same directory. Copy that file and paste it into our ServiceAgent project. Now finally we are all set to code for our service agent class. The whole code for this class is as following. Starting from top as per Listing 1.3, first we create constant to hold endpoint url. The constructor calls method CreateBasicHttpBinding which creates binding object. Later the method DoSum uses async/await to implement await able method for asynchronous DoSum operation on the service by invoking BeginDoSum and EndDoSum pair. At this point, we are all set to create three different mobile applications in iOS, Android and Windows Phone 8. In second part of this article, we will accomplish that! Stay tuned. The article part 2 is here.